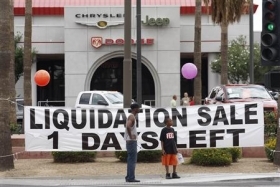 Chrysler stores shut June 9 now have a chance at re-opening. DETROIT -- Chrysler Group today sent letters to 789 rejected U.S. dealerships, kicking off a legislated process that could restore the franchises through arbitration. The dealers have until Jan. 25 to notify Chrysler they intend to seek arbitration, the letter said, reiterating terms of a measure signed into law on Dec. 16. The letter does not contain Chrysler's list of criteria for rejection. Chrysler, as required by the law, will outline those terms in individual letters to be sent before Jan. 16, spokeswoman Kathy Graham said. The dealers lost their franchises June 9 at the end of Chrysler's six-week, U.S.-directed trip through bankruptcy court. The arbitration process was signed by President Barack Obama as part of a $446 billion appropriations bill. The legislation also affects General Motors Co., which announced plans to terminate 1,350 dealerships in May in advance of its bankruptcy. The law requires that arbitration must be wrapped up in six months. Chrysler said in the form letter today that it is “assessing its rights and remedies with respect'' to the legislation. Earlier in December, Chrysler had proposed its own binding arbitration process to keep Congress from getting involved. The negotiations ended when the legislation was introduced. Marchionne said Chrysler's offer would have “guaranteed a disgruntled dealer the opportunity to air its concern. Having said this, if Congress wants this, Congress gets this. And we'll live with the consequences and react accordingly." Doug Alley, owner of rejected Alley's Chrysler Dodge in Kingsport, Tenn, said he hasn't yet decided whether he'll seek arbitration.